BBC News has thousands of journalists, a multi-million pound budget and hundreds of millions of users worldwide. 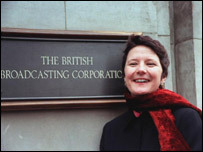 So just how does news chief Helen Boaden manage it all? Simple, she just thinks of the audiences. Does BBC News have a "mission statement"? Audiences are at the heart of BBC News which strives to report what matters in the UK and around the world with independence and impartiality. Through its emphasis on specialist knowledge, international newsgathering, and its breadth of programmes, BBC News seeks to deliver a complete news package, covering arts, science, sport, politics, business and world affairs. What falls under the BBC News banner? It is also responsible for the continuous news channels BBC News 24, BBC Parliament, BBC World, interactive services, Ceefax and the BBC News website. Programmes made by Television News include the BBC One bulletins, Breakfast and Breakfast with Frost, Newsnight on BBC Two, 60 seconds on BBC Three and the news output on BBC Four. BBC Radio News produces between two and three hours of programming for every hour of the day. It is broadcast across seven UK radio networks and around the globe on the BBC World Service. Radio News also produces material for BBC Scotland, BBC Wales and BBC Northern Ireland and for BBC local radio. Programmes made by Radio News include Today, The World at One, PM, The World Tonight, Broadcasting House and The World This Weekend. How big is the BBC News budget - is it justified? BBC News has an annual budget of £350 million (2004/05). BBC News is highly respected both in the UK and around the world, from the World Service which reaches a global audience of more than 150 million listeners with hundreds of bulletins in more than 40 languages every day, to the BBC's flagship television news programme The Ten O'Clock news programme on BBC One. The breadth and depth of BBC news coverage is unrivalled, with subject specialists who can throw a spotlight on people and stories which are not widely known. There is no universal news agenda that applies to all. That is why we broadcast in many different styles and via many different media. The BBC's news service is trusted and respected and represents excellent value for money. How big is BBC News and where is it based? The bulk of programming comes from the news centre in Television Centre, west London - the largest such operation in the world. Political programming, including the BBC Parliament channel, is based in the heart of Westminster at Millbank while international radio programming comes from the home of World Service - Bush House in central London. The current staff total is 3,500. We also have staff across the UK, and in key news bureaux around the world to provide viewers with a breadth and depth of information about a wider world. How many people do we employ in the UK and worldwide and in how many bureaux? BBC News is the largest broadcast news operation in the world with more than 2,000 journalists and 44 newsgathering bureaux, 41 of which are overseas. To what extent do we "compete" with Sky News and ITN and, globally, CNN across our platforms? BBC News 24 was launched to be the best UK television news channel. We compete to be the best, with our emphasis being first-hand coverage of the latest breaking news with a commitment to depth, context and intelligent analysis. We always welcome the competition that plurality brings; greater choice for the viewer is a positive move. 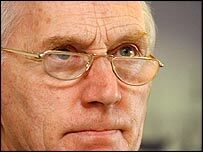 One can't contest the impact the Hutton Report had on the BBC, but we have learnt from the experience and moved on. Does BBC News produce regional bulletins as well? BBC News does not produce the BBC's UK regional news programmes and service but works very closely with BBC Nations and Regions across all media to ensure that we reflect the diverse picture of life in communities throughout the UK. Do you think BBC News has a good relationship with its audiences? Audiences are at the heart of what we do. The BBC sees its audience as citizens who have a right to independent and impartial information, and we gauge their feedback whenever we can. Recent opinion polls have suggested that audiences have not lost trust in BBC News following the events of last summer; in latest research, 78% of respondents said that they continued to view the Corporation in the same way they had prior to the Hutton report. Has the BBC achieved "closure" regarding the Hutton Report? One can't contest the impact the Report had on the BBC, but we have learnt from the experience and moved on. Are we meeting the recommendations of the Neil Report, such as impartiality, truth, accuracy and diversity of opinion? The BBC News mantra has always been one of truth, impartiality, accuracy and diversity of opinion. The BBC has always recognised the fundamental need for independent journalism to support a healthy democracy, and sought to be a trusted guide in an information age. Accommodating a range of views is a must for democratic debate, and BBC News has always endeavoured to offer a platform for such voices. As the Head of News, who are you accountable to? The Director of News reports to the Director General, Mark Thompson, and the Deputy Director General, Mark Byford, but all in the BBC are accountable to the most important 'stake holders' - the licence fee payers. What next for BBC News? Are we prepared for the nature of news demand from our audiences across ever-changing platforms? Audiences are consuming news coverage in increasingly different ways, it is our job to keep up with the demand. BBC news has always embraced the potential of new technology, as highlighted with a recent broadcast report via a mobile phone.